Missoula Children’s Theatre, a traveling theater company out of Montana, will be providing a weeklong theater workshop in Urbana beginning July 13 for kids in grades K-9. The workshop will culminate with two live performances of the musical “Blackbeard the Pirate,” which will take place July 17 and 18 at the Gloria Theatre. A little red truck will arrive in Urbana on Monday, July 13, with everything needed for a full-scale musical production minus one thing – the cast. Missoula Children’s Theatre (MCT), the world’s largest touring children’s theater, is seeking area children interested in taking part in a weeklong theater workshop led by a team of two professional actors/directors. 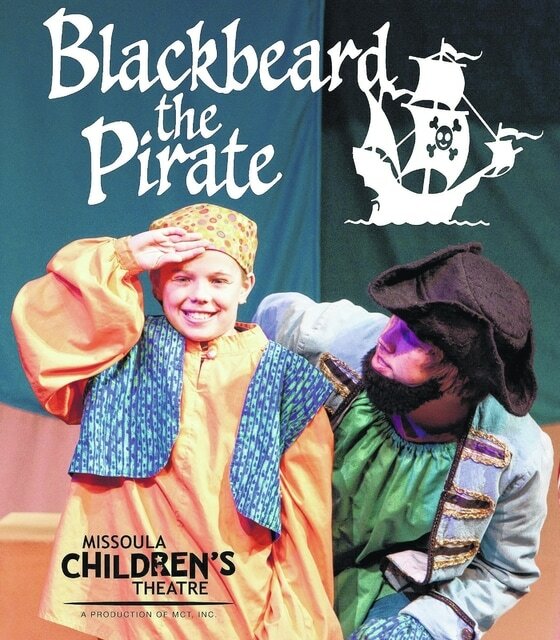 The workshop will culminate with two live performances of “Blackbeard the Pirate” at the Gloria Theatre, 216 S. Main St. The traveling theater, based in Montana, is being offered to the community by the GrandWorks Foundation, the nonprofit group in charge of redeveloping the Gloria. In order to bring MCT to Urbana, the GrandWorks Foundation paid a presenter fee, which the organization could have passed on to children through a registration fee. Instead, GrandWorks isn’t charging fees to participants. Instead, it’s seeking financial help from local businesses, groups and individuals. “We are still looking for sponsors to help cover the costs of hosting Missoula,” Hess said, noting sponsorship levels begin at $50 and can be arranged by contacting her directly at 937-612-1651. While the program is free to participants, MCT limits all its productions to a cast of 50 to 60 children. In order to reach this number, the company holds auditions. Local auditions will take place at 10 a.m. on Monday, July 13, at the Gloria. “Those auditioning must be present for the entire two-hour audition session in order to be cast,” Hess said. Children selected to participate in the theater workshop will be given their weeklong schedule, which consists of daily rehearsal times. Hess said rehearsals will be held from noon to 2:30 p.m. on Monday, July 13, and from 10 a.m. to 2:30 p.m. (30-minute lunch break at noon) Tuesday through Friday. Following a week of rehearsing, the children will take to the Gloria Theatre stage at 7 p.m. on Friday, July 17, and at 3 p.m. on Saturday, July 18. Presale tickets will be available at the theater during rehearsals (Tuesday through Friday) at a cost of $7 for adults and $4 for senior citizens and children under the age of 10. Tickets purchased at the door will be $10 for adults and $5 for senior citizens and children under 10. All the proceeds from ticket sales will go toward renovations at the Gloria. “We are currently working on upgrading the electrical backstage,” Hess said. “With help from Evans Electric and our many volunteers, we have also installed dimmable overhead lighting onstage for future performances. “We’ve definitely come a long way from where we started, but there’s still much left to do,” she added. As part of the agreement between MCT and GrandWorks, MCT will offer three free workshops at the Gloria. On Tuesday, July 14, children in first and second grade are invited to participate in “Mime Time,” a workshop that allows children to see how gestures, illusions and body language are used to tell a story. The second workshop, “Take 5!,” which will be held on Wednesday, July 15, is designed for teachers and educators to understand how to bring the fun and excitement of theater into their classrooms. On Thursday, July 16, “Mime Time” will take place again, but this time, the workshop will be geared toward students in grades 3-12. All workshops begin at 3:30 p.m. and are expected to last 45 minutes. Due to size restrictions, preregistration is required. Anyone interested in signing up for a workshop must contact Hess 24 hours in advance by calling 937-612-1651 or emailing lydia@grandworks.com.